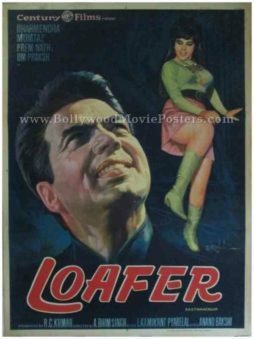 Old Bollywood poster for sale of the hit Hindi film Loafer (1973). 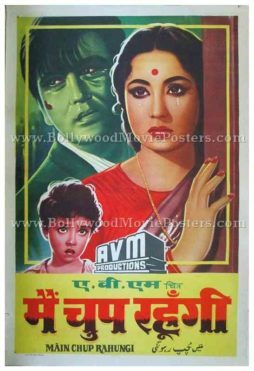 This is an actual surviving vintage Bollywood poster for sale of the 1973 Hindi film that starred the original He-Man of Bollywood, Dharmendra and actress Mumtaz in lead roles. This vintage Indian film poster was originally hand painted on canvas by leading Bollywood poster artist D.R. Bhosle. 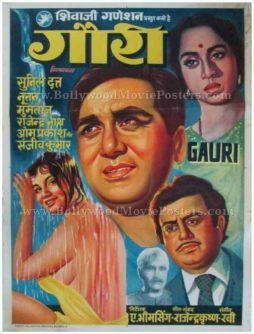 His printed signature is seen on the center left of this beautiful old handmade Bollywood movie poster. A fabulous close up of actress Mumtaz is seen on the right of the poster, painted using soothing color tones. A more dramatic hand painted rendition of Dharmendra is seen alongside. 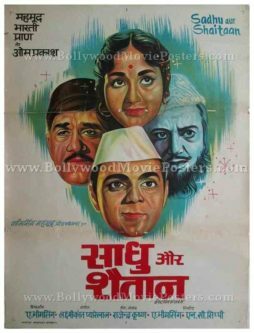 Supporting actor Om Prakash is seen in a smaller hand painted avatar on the bottom right of this old Bollywood movie poster. Master Bollywood poster painter D.R. Bhosle’s signature realism and flair is apparent in this vintage Bollywood poster for sale. 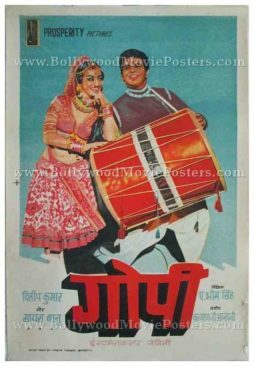 Old Bollywood movie poster of the hit Hindi film, Main Chup Rahungi (1962) for sale. This is an actual surviving original vintage Bollywood movie poster of the 1962 Hindi film that featured the Tragedy Queen of Bollywood, Meena Kumari in the lead role opposite Sunil Dutt. For her stellar performance in the film, Meena Kumari received a nomination for the Filmfare Best Actress Award, making this poster highly collectible! In the same year, Meena Kumari was also nominated for the Filmfare Best Actress Award for two other films, establishing a record by having all three nominations for Best Actress of the year (1963) to her credit. Printed and circulated during the first release run of the film (early 1960s), this old hand painted Bollywood movie poster was originally designed for publicity of the film but never ended up being used. This old Bollywood movie poster features beautiful vintage hand painted artwork. A hand painted portrait of actress Meena Kumari crying is seen on the right hand side of the poster. Sunil Dutt appears alongside hand painted in a green Hulk-like avatar. 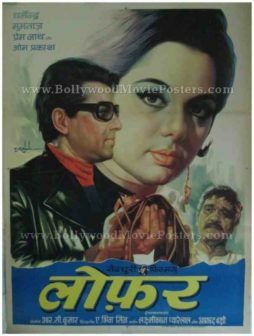 Old Bollywood movie poster of the Hindi film, Gopi (1970) for sale. This is an actual surviving original vintage Bollywood movie poster of the 1970 Hindi film that featured real life couple, Dilip Kumar and Saira Banu in lead roles. Considered as the greatest method actor in Indian cinema and often labeled as “tragedy king,” Dilip Kumar received a Filmfare award nomination for his stellar performance in the film. This vintage Bollywood movie poster features stunning over painted artwork. Originally hand painted on canvas by a Bollywood poster artist, the design of this vintage Bollywood poster features the lead couple smiling. Dilip Kumar is seen with an over sized drum strapped to his shoulders while Saira Banu playfully rests her arms on the same. This old Bollywood poster has been graded as ★★★ Average mainly due to a tattered upper border. Overall excellent display condition.